Welcome to Gerald Gray Law Firm! We have been serving the legal needs of our clients in Southwest Virginia for over 30 years. We strive to provide the most current and proven legal counsel and services possible with our experienced and dedicated staff - our people really do make the difference! We challenge ourselves to get to know our clients personally, and to truly understand their needs in order to ensure their success. It is only when our clients are successful that our mission is complete and we are successful too. Virginia Business Magazine's "The Legal Elite 2006 - Criminal Law"
Any information obtained while on this site is not intended to be legal advice. You should contact an attorney to discuss legal issues. 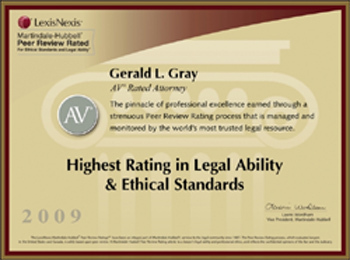 © 2009 Gerald Gray Law Firm , PC, All Rights Reserved.